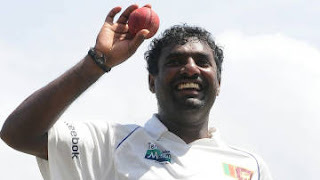 It was a historic day for Sri Lankan cricket as the veteran off spinner Muttiah Muralitharan reached his 800th wicket in test cricket, most ironically with the last ball he delivered in a test cricket match. Can you expect a more dramatic retirement for a legend like Murali? Sri Lankan Twitter community gathered around the hash tag #murali ever since last evening, and tweeted to each other about their feelings of the retiring cricket maestro. 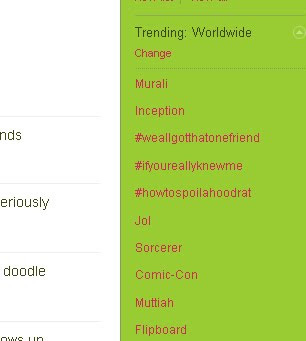 At one point, someone pointed “Murali” is trending on Twitter! So, we thought this is the best way, we; the Sri Lankan Tweeps can pay tribute to the greatest ever cricketer, the world has ever seen after, Don Bradman. The idea spread like a virus, and one after another, Sri Lankan Tweeps started tweeting #murali. @Latek educated the others about how Twitter Trending topics works. We personal messaged our followers all over the world, to join in the “#murali” party, and make it a worldwide trending topic, to pay tribute to our hero. We realized, if we get more #murali tweets from different locations around the world, more likely it was to reach the top 10 of trending topics. Today, the virus spread across Palk Strait to India, and our Indian fellow Tweeps joined into to tweet about “Murali”. Added to this, were the natural tweets coming in from all cricket fans from England, Australia, New Zealand and South Africa; all of a sudden we got it on the top 10 trending topics on Twitter. When Murali took Ojha’s wicket to claim his 800th wicket in test cricket, everybody started congratulating #murali and there came the news tweets from various news agencies on Twitter, who wanted to break the news of Murali’s achievement. Fun thing to know is, Americans who never give a damn about cricket are the ones who dominate all of Twitter. Nevertheless, with a carefully coordinated attack from this small region in the Indian Ocean, we managed to create a Twitter trending topic, at least for few hours! Thank you Murali! This is a tribute from all Twitter users from Sri Lanka, for your wonderful achievement. Twitter trending topics are created mainly based on two variables; 1) Frequency and 2) Spread. Frequency is the number of times the target word is appearing on Twitter feeds within s specific period (within an hour etc). Spread, is the number of people mentioning the word. As per my observation on “murali”, what is more important is the spread. For example, a same set of 100 or 200 people tweeting the same thing over and over again, will not create an immediate trending topic on Twitter. That will have an impact in the initial take-off, but for it to reach the top 10 you need more and more people jumping into the bandwagon. This is why, “murali” remained at around rank 20 for a long time, and suddenly reached the #1 when more new people started to tweet about “murali”. This shows, how impractical it is to create trending topics for commercial purpose. The lesson for Twitter, is that they can make Twitter a more globalized social network, by allowing topics like “murali” to trend quite often. So far, Twitter remains to be mainly an American property. That’s why we always see what Americans like on trending topics. UPDATE: I may have missed few important names here, but some of them are added now in the comments section :-) If you remembers more Tweeps, pls add as a comment below. Ya, it was fun :-) I would have missed few names up there. There were whole lot more, and I only listed the few that I could remember. yesterday evening #murali is in the trending list 4 few minutes, i'm so happy 2 partcipate this event :) team effort give us the success!!!!! Matey, you missed many from this list though. @Budhajeewa @Udaraumd @Binku @chathuraw and many guys should be included as they first few who speared this. Yya, ya, I know I missed a few... I added some to comments section later :-) Thanks for mentioning them. wOw... great post.. actually, we started #murali hashtag day before yesterday(21/07/2010).. and we could bring it to the 5th place in the trending topics list.. and yesterday we were trying hard to bring it back to the list and again we brought #murali to the 5th place before Murali got his 800th wicket.. and then we kept on tweeting and spread the news as you have mentioned.. so ultimately #murali came to the first in TT list..
As you have mentioned this is a great and Greatest achievement of Sri Lankan tweetaholics.. Yes, Murali won the social media too! As cyberholics, we can say that we saluted Murali "our way"! Yep, I was there when we hit #5 on 21st evening. But then, the timing wasn't right as more Europeans started tweeting early in their work day. Trick on 22nd was our timing. Murali got his 800th wicket after Lunch, and at that time, it's mid day here in Sri Lanka/India, so we had the "controlling power" on Twitter (as most Americans were sound asleep). Learning point is, if we (Asians) want to make a trending topic happen, we have to time it around 12.00pm to 3.00pm SLT/IST. Because, that's the peak day time here, late night (1.00am - 4.00am) time for most Americans, and morning rush hours in Europe. I'd love to test this formula again :-) Target a hash tag and coordinate a "TTT Attack". Well prepared article on the 'unprepared #murali event' we had on twitter for 2 days. A nice take on a vibrant event. Great connecting & writing !